there a way to do that with GIMP? > there a way to do that with GIMP? ups of ground/sky or other parts of the panoarama. is true, just copy the image and crop as desired. distortion using negative values in the lens distortion filter. Is it about a bicycle ? >ups of ground/sky or other parts of the panoarama. unable to find a solution. can you direct me? my os is linux mint. That is what happens when you give just the minimum of information. 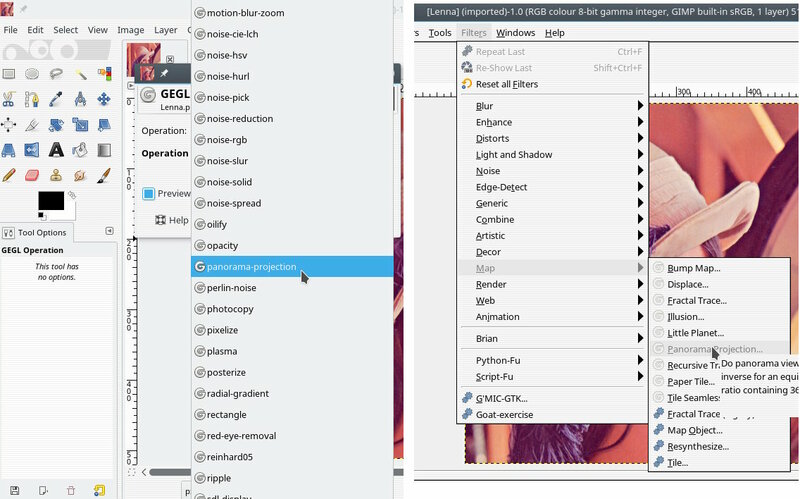 If using Gimp 2.10 then look in Filters -> Map -> Panorama Projection. It would really help if you gave details of the image. >That is what happens when you give just the minimum of information. >If using Gimp 2.10 then look in Filters -> Map -> Panorama Projection. >It would really help if you gave details of the image. manager upgrades it. In any casewhich of the menu options should I select? pull one of those from google. That shown in the inset. >the menu Tools -> GEGL operation. >but it was in the pic! Bummer! Looks like I need more ram.